The European Chamber is announce the next Auto-Components Working Group meeting jointly held with Automotive Working Group Beijing, which will take place on 22nd March from 09:00 to 10:30. At the meeting, Mr. Bill Russo, Senior Advisor of Booz & Company, will deliver a presentation of “The State of China's Auto Industry in 2013 and Implications for Suppliers”. The presentation will be given in Shanghai and transmitted over video conference. Bill Russo is the Founder and President of Synergistics Limited and a Senior Advisor with Booz & Company. With over 15 years as an automotive executive with Chrysler, including over 8 years of experience in China and Asia, Mr. Russo has worked with numerous global firms in the formulation and implementation of their globalization strategies. His experience in China includes having been the VP of Chrysler North East Asia where he successfully negotiated agreements with partners and obtained required approvals from the China government to bring 6 new vehicle programs to the market in a 3-year period, as well as establishing an infrastructure for localization and sales/distribution. Mr. Russo has a Bachelor of Science in Chemical Engineering from Columbia University in New York, and a Master of Science in Manufacturing Systems Engineering from Lehigh University in Bethlehem, Pennsylvania. He is a highly sought after opinion leader on the development of the automotive industry. 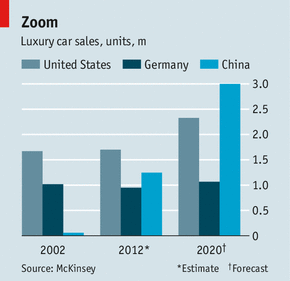 MAKERS of luxuries are nervous about China. Its economy has cooled. Worse, its new political leaders are threatening to crack down on ostentation and corruption. What should have been a season of festive political “gift giving” has become a nightmare of rectitude for manufacturers of expensive watches, jewellery and the like. Yet firms that sell fancy cars are as ebullient as ever. China’s market for such cars has grown 36% a year over the past decade. A new report from McKinsey, a consultancy, calculates that China is now the world’s second-largest market for “premium” cars (which include posh brands like BMW and Aston Martin plus the snazziest offerings from mass-market producers like Volkswagen and GM). It estimates that China will surpass America by 2020 to become the world’s biggest consumer (see chart). Would not a crackdown on official cars hamper this growth? In the past it might have. The market for luxury cars was initially fuelled by demand for chauffeur-driven models for officials (black Audis are preferred). Bill Russo of Booz & Company, another consultancy, observes that BMW designed a model just for China with a longer wheelbase, to give back-seat passengers more room; it is so successful that it is now being exported. But even a slowdown in official purchases won’t curb growth much, insists Sha Sha, a co-author of the McKinsey report. Government customers now account for just a tenth of total sales. The surge is due to private demand, including from women and younger drivers. By 2020 China will have 23m affluent households with a disposable income of at least 450,000 yuan ($72,000) a year. Many are in smaller cities ill served by the foreign firms that control this segment. Could that create an opening for Chinese firms? It seems unlikely. Most local cars are produced by state-owned enterprises (SOEs) working in joint ventures with foreign firms like GM and Volkswagen, while some are from private firms like Geely. Another report, from Sanford C. Bernstein, an investment bank, argues that the “SOEs are lumbering, lack entrepreneurial spirit” and rely on foreign technology, while private competitors are “small, lack technology and sell low-priced cars”. Despite decades of trying, China today “cannot build a globally competitive car”, the report bluntly concludes. Chinese drivers do not expect them to succeed soon. Consumers surveyed by McKinsey doubt that Chinese manufacturers will be able to come up with a swooshy car worth buying before 2020.